The European Regulation on Classification, Labeling and Packaging of chemical substances and mixtures (CLP regulation No. 1272/2008) aims to protect workers, consumers and the environment by means of labeling, which reflects hazard of chemicals in a consistent way, everywhere around the world. This regulation entered into force on 20 January 2009. Companies have to track and trace carcinogenic, mutagenic and reproduction toxic (CMR) chemicals within their organization, to live up to government legislation and their own safety and health policies. 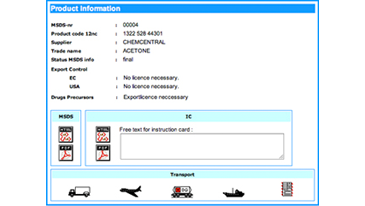 Thanks to the Register of Dangerous Substances (RDS) in our chemical database eFasim4you, users can track and trace and generate an overview of carcinogenic, mutagenic and reproduction toxic substances within their organization at any time. “Today, we’re facing increasingly complicated reporting,” says Harrold van Rooij, Customer and Contract Support Officer, Sustainability Office NXP. “In different regions, you need to declare different substances to the authorities and if your reporting isn’t perfectly in order, you might have to stop producing, or even recall products. NXP has quite a lot of production locations and thanks to ‘eFasim,’ we can cater to different local reporting requirements, but also easily exchange learnings and best practices. Any professional who deals with chemicals, from environmental staff to lab workers, developers, production and logistics personnel to import and export managers, can log in and extract substance information as MSDS (Material Safety Data Sheets) in nine languages*, including Chinese. For each substance and mixture, there’s an MSDS indicating hazards identification, physical and chemical properties, safety recommendations, cleanup, transport, first-aid guidelines and more. 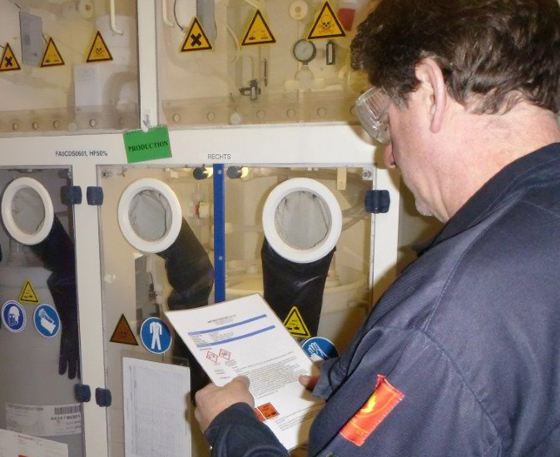 Photo: A distribution operator at NXP’s Nijmegen semiconductor fab checks the MSDS to find out a chemical’s hazardous properties and which protective measures to take. Demo on complying with chemical regulations. *Chinese, Dutch, English, French, German, Italian, Polish, Portuguese, Spanish.